I had my doubts this morning. The forecast predicted was 80 degrees and sunny. Wait, what? It was 59 degrees and foggy at 7am this morning. However around 10 am the clouds parted, and the skies cleared, oh yeah there’s the sun. Missed it this last few rainy, cold, fall (gasp! already) days. I am still clinging to summer. If you feel the same way here is a perfect end of summer meal. I served it with a bright green salad and a big hunk of warm bread for all that yummy, garlicky sauce. And to kick it up a notch open a nice Chardonnay, it is Friday. Start by cutting open your spaghetti squash and clean out all the seeds. Drizzle with olive oil and salt and pepper. Bake cut side down on foil lined baking sheet 25-35 mins at 375 degrees. When done scrape out strings with fork and place in large serving bowl. Wash and butterfly your shrimp, set aside. Now thinly slice onion, add to olive oil (1/4 cup) in a large frying pan or pot. Cook on low, stirring occasionally for 5-10 minutes. Add minced garlic, cook 1-2 mins. Add 1/2 cup white wine,increase heat to medium cook few minutes then add chicken or veg stock. Simmer over medium heat until liquid reduces by 1/4 and add cherry tomatoes. Add shrimp, cooking few minutes per side until they curl slightly and turn pink. Toss some fresh chopped parsley over top, pour some of the stock over spaghetti squash and toss then place shrimp on top. 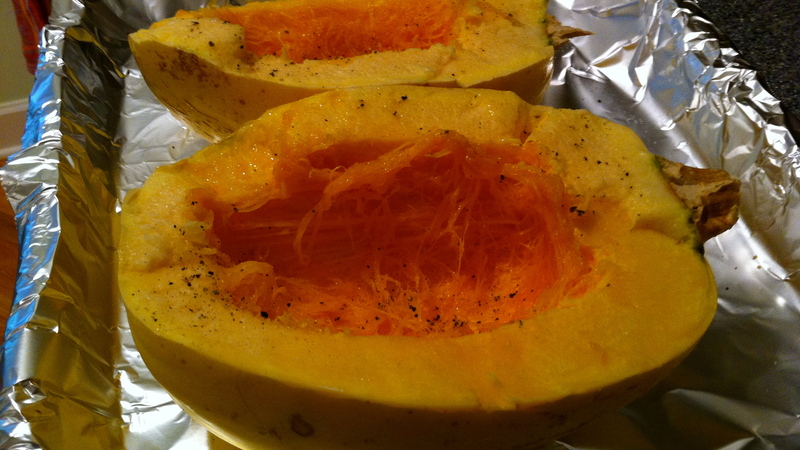 Cut spaghetti squash in half, clean out seeds. Sprinkle inside with olive oil and salt and pepper. Bake 25-35 minutes in a 375 degree oven. When done scrape out strings with fork to large serving bowl and set aside. Add olive oil to large skillet, add onion and salt and pepper, cook 5-10 minutes on low heat, until translucent and slightly browned on edges. Add garlic, cook 1-2 minutes. Turn up heat to medium add white wine, cook 2 minutes, add chicken/veg stock and continue to simmer until reduced by about ¼ cup. Add cherry tomatoes and hot pepper flakes. Cook 2 minutes. 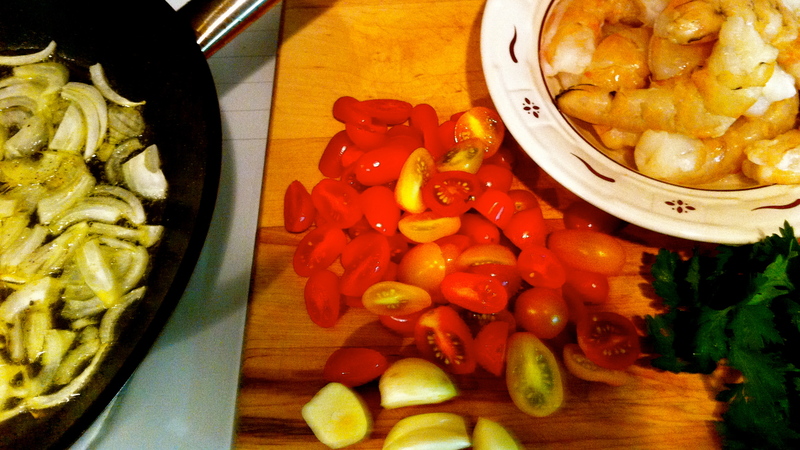 Add shrimp and cook 2-3 minutes per side until curl slightly and turn pink. 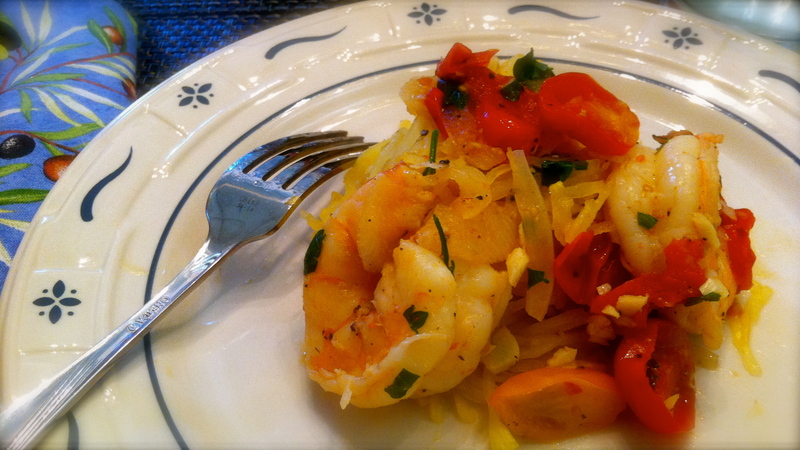 Toss cooking liquid with spaghetti squash, place shrimp on top. Wonderful recipe. I will indeed be adding this to my menu! Thank you! Love your blog and delectable recipes, Pamela! Perhaps you could teach/host a cooking class in the near future. That would be wonderful! Nice post. Site got a matter of seconds in order to load, but well worth the hold out. Just made this for dinner tonight. It was absolutely delicious! Definitely a favorite!